How to Treat Skin Problems in Dogs? Skin infections in canine, is one of the most common reason for vet visits by pet parents. Pups, being with low immune system are at a greater risk of falling into skin problems. Fleas and ticks, external parasites, environmental changes, food allergies, etc all contribute to skin issues in dogs. When it comes to causing skin allergies in dogs, fleas, the blood sucking parasites does the most damage to a canine’s skin. Furry pals, being allergic to flea saliva developed an itching sensation when bitten by a flea parasite. Pet parent, in this regard do need to care extra, especially if they possess young puppies. A little awareness of the issue followed by some preventive measures will ensure complete protection of your pet’s skin. In a dog life cycle, the most common cause of his distress and discomfort came in the form of tiny little blood-sucking insects that feed on his body. These parasites are often invisible from the worldly eyes, and live by consuming the blood from their host’s skin. The saliva, which these, parasites produces causes itching sensation in the host’s body. Dogs, are allergic to this flea saliva, which lead to feeling of itchiness, after being bitten. • Treating the indoor and outdoor environment, the area where your dog dwells most. 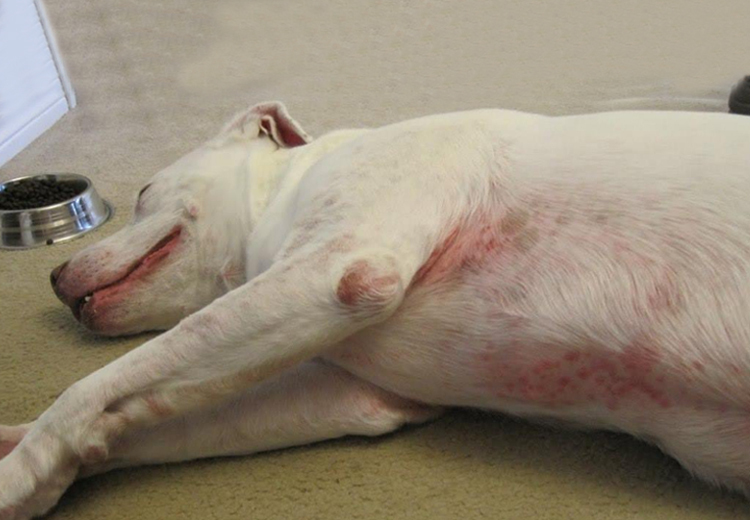 This is the second most common cause of skin reactions in dogs. It is similar with the hay fever, associated with humans. Atopic dermatitis is a skin condition associated with allergies. These allergies largely occurred when a pet is introduced to new environment or come in contact with something, which he is not used to. A pet can get this kind of allergy from plants, insects, grass, pollen, food, medicine, etc. Treatment: A vet will examine the causes of allergy, taking pet’s, medical and biological, history into account. Once done with the test, the vet will follow necessary treatment procedure. Food allergy, is often caused by high intake of proteins in pet’s diet. Dogs with food allergy show signs of itchiness and vomiting. Pet parents must form their pet’s dietary habits after consulting a vet. A vet would provide necessary suggestions to improve your pet’s diet and to replace any food from your pet’s plate, if need arises. Apart from this, never allow your pet to eat roadside rubbish, whenever you go out with your pet. A proper check on your pet’s food habits will ensure overall bodily health of your pet. Ringworms in pets can be, identified by round like patches on pet’s skin. It is a fungal infection and is highly contagious among pets. A pet, with ringworm must be, treated in isolation. Proper cleaning of house and environment becomes mandatory, on part of pet parents, to stop the infection from spreading. Treatment in this regard is vet visit, if infection persists for a longer duration. • Diet- give your pet a healthy diet. It is a cold season phenomena. A long exposure to cold will freezes the tip of ear and tail of your pet. Skin becomes pale due to lack of blood flow. Therefore, during winters it is, advised to avoid going out with your pet. In cold times , provide your pet a warm environment. Take care of his clothing, and use late mornings for exposing his skin to sunlight for warmness. Skin infections can be a great source of distress to your pet’s everyday life. With proper grooming and tracking your pet’s health through regular vet visits will ensure your pet’s skin in its most beautiful form.